Is this the ultimate combination of HDTV and PC monitor? 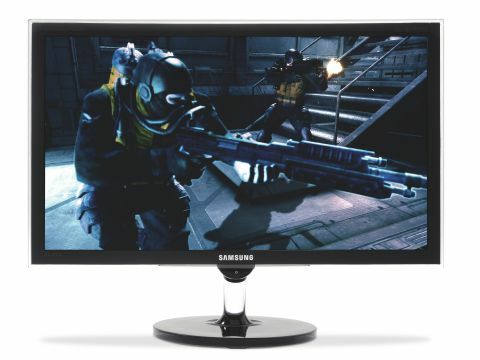 Is the Samsung SyncMaster FX2490HD any good as either an HDTV or monitor? Doesn't meet the UK specific requirements for HDTV broadcasts. TN panel disappointing. PC monitor and HDTV technology have been converging in recent years. The new Samsung SyncMaster FX2490HD takes that trend to its logic conclusion. Superficially, it's a pretty ordinary 24-inch PC monitor, albeit a snazzy-looking example with an LED backlight. But it also packs a digital TV tuner and IR remote. So, it's the ultimate, two-in-one? Not quite. The panel itself sports an HDTV-aping 16:9 aspect ratio and packs a 1080p Full HD pixel grid. However, as far as UK users are concerned, the TV tuner is not HD. It's standard DTV only. That means you'll need an external Freeview HD box or similar to enable HDTV visuals. In that sense, the Samsung SyncMaster FX2490HD is no more an HDTV than any monitor with an HDMI port. What's more, at nearly £400, this is one pricey PC monitor, especially given its TN LCD panel. For this sort of cash, you'd normally expect one of Samsung's spectacular PVA panels.